Firstly, I'd like to take a moment to address a little situation that happened recently here on the site. Having been a fan of David Bazan and all that he has blessed many of his listeners (including myself) with for many years now, I jumped at the chance to report on the near future release of his highly anticipated first solo album. My report however was unfortunately misconstrued as something a lot more "underhanded" and "dishonest" then my original innocent eagerness to publicize an artist for whom I have an incredible amount of personal admiration and respect for. I accept, that in my haste and excitement I did not properly credit the source from which the review came from and this mistake should have been rectified. I was not, by any means, trying to take any credit for the beautifully written piece found in The Chicago Reader, more to the truthful point I was trying to spread the word and publicize an artist lesser known here in the United Kingdom. I would therefore like to take full responsibility for my actions and take this moment to apologize to any one that I may have offended or upset. My actions were true and neither sly nor selfish and this will forever be the case with all my future work as it so evidently has been in the past. Former front man of christian rock band Pedro The Lion David Bazan recently released his first ever music DVD - comprising a collection of some of his best solo songs with a live and unscripted interview. In the wake of the up coming release of Bazan's debut solo album, Curse Your Branches, we took a look at the appropriately titled Alone At The Microphone to see if Bazan can really hold his own. Bypassing any conventional opening credits; which you'll see isn't a rare occurrences in this experimental production, were sent straight into the performance. David Bazan sits at an old, key stained an dust coated piano. The strings inside exposed and hammering away with every note. 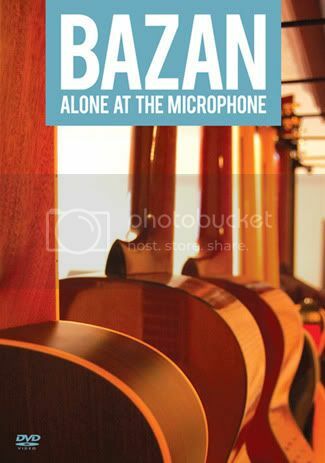 A small clock sits on the corner of the piano opposite Bazan but time seems to be momentarily suspended here. Bazan press the bristles of his beard against the microphone, hitting each key with great conviction as this emotion driven opener sees him bellowing with confession into the lines of "I Never Wanted You". It's certainly an interesting and refreshing version of the track to start off with considering many Bazan fans would be so used to seeing him partnered with his trusty acoustic guitar. As soon as one song has finished another has started. The second performance sees the return of the familiar electric governed Bazan. A performance reminiscent of Bazan during his heyday with Pedro The Lion. The camera angles are a little disappointing here, shooting Bazan from the chest up, excluding the guitar from being in shot, which fans who study these types of videos just for the guitar tabs will be rather disappointed with. An impromptu interview with Bazan follows. I'm not really sure why the colour changes to black and white and find that this makes the interview and it's subject a little distant and closed off, rather then the type of intimate and inclusive interview you may other wise find produced in colour. The interview touches upon Bazan's struggles in writing new material, as he speaks openly about his aims and his thoughts/feelings around the music he's produced. Bazan also shares an interesting candid moment on doing interviews in general, which seems a little contradictory given the circumstance. I hate to be picky, but the lack of camera angle changes, makes the one repetitive static shots hard to watch after a while. Although I'm sure this DVD wasn't put together with an artsy intention in mind, the failure to make the DVD visual enjoyable is a bit of a let down.